There’s no greater comfort than the aroma of freshly baked bread. I believe that is a scientifically proven fact. I’m no master artisan bread baker — not by a long shot! But I can pull off a few loaves, and this is one of my favorites. It’s not passed down through generations or anything fun like that. In fact, it’s just something I got off AllRecipes or some such useful website a handful of years ago and tweaked until I got my idea of the perfect bread for soup. I love a lot of things about it: for one, the ease. I started having pain in my left hand a few years ago and so I don’t want anything that I have to knead by hand. This works just perfectly in a standing mixer using a dough hook. Also, the ingredients are super simple; things that anyone who wants freshly baked bread should have around at all times. The olive oil provides a subtle sweet aroma that just makes it smell and taste even more warm and inviting. But what I really love is the texture! It’s got an almost biscuit-like quality. I love to rip into a chewy crust as much as the next guy, but sometimes with soup I prefer a crisper bite. When lightly toasted, it makes a fabulous crouton. I love to drizzle with just a tiny bit of olive oil and place atop my bowl o’ soup. And even though I’m a self-admitted non-master artisan bread baker, I do have a few tips for the home baker! For one, temperature is important to activate the yeast. Things should be on the warm side – that includes the equipment. If it’s very cold in my kitchen I make sure to warm my mixer bowl up either by a brief stint in the oven, or running under hot water. Same goes for the bowl that the bread rises in. I use a glass bowl, so I can even microwave it for 30 seconds to get it warm. Note: Not hot, just warm! I also set the bread to rise where ever is warmest. If I’m doing a lot of cooking and baking and my oven is still warm, then often just leaving it on top of the stove will do. But sometimes I place it in my bedroom to rise, because it gets the most sun. An added bonus…your room will smell like bread! And I have a few tips for forming the loaf. After the first rise, I don’t punch the dough down and knead again. Instead, I gently lift the dough out onto a clean surface and I form a long oval loaf shape. Then I roll the bread out like a rolling pin, shaping as I go to keep the ends round, until it reaches the desired shape. I think this is a great recipe to start off with if you’re new to bread baking! If you do it often enough, you can just be making the bread in the background, letting it knead away while you multitask on something else. It just becomes second nature after awhile. The most important thing is to get started, don’t be intimidated and try it once. Perhaps before you know it you’ll just become the kind of person that bakes their own bread. Oh and one last thing: I’ve had great success replacing a cup of the AP flour with spelt, so try that if you’re looking for a heartier loaf. Add water and sugar to the workbowl of a standing mixer fit with a dough hook. Sprinkle in the yeast and let sit for 5 minutes. Add 1 cup of the flour along with the salt. Mix on low until well incorporated, and then turn the speed up to medium and mix for 3 minutes. Add another 1/2 cup of flour and mix well, starting on low and then switching to medium speed. Then add another 1/2 cup of flour, again starting on low and switching to medium. Knead on medium for about 5 minutes. You may occasionally have to get in there with your hands if the dough starts climbing up the hook. It should become smooth and elastic and slightly sticky. At this point, incorporate flour by the table spoon, until it is no longer sticky. When it starts to seem dry, stop adding flour. This could be anywhere between 1/4 and 1/2 cup. Knead again on medium until it is smooth. Meanwhile, drizzle about a tablespoon of olive oil into a large bowl. The dough will double in size, so make sure you have enough room. Form the dough into a ball and place in the bowl, tossing it around to coat with oil. Cover the top in plastic wrap and put in a warm place. Let dough rise for about an hour, or until doubled in size. Now gently remove the dough from the bowl and place on a clean, dry surface. I don’t ever have to flour the surface, but if it seems sticky or the surface is very warm, you may need to. 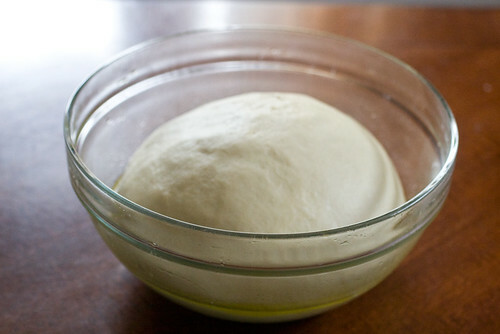 Gently form the dough into a long oval. 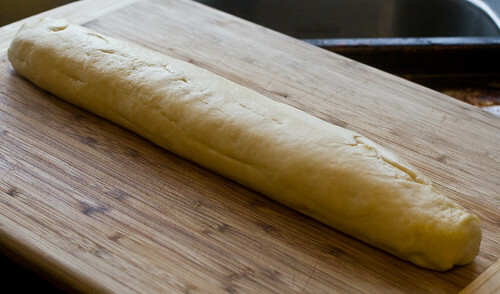 Now roll out and form a loaf that is roughly 14 inches long and 4 inches wide. Place on a lightly greased baking sheet. Score it across the top in three diagonal slices, drizzle with a little olive oil and let rise for about 15 minutes. In the meantime, preheat the oven to 375 F.
Place in the oven and bake for 25 minutes. Lower the heat to 350 F and bake an additional 10 to 15 minutes. Use tongs to check the bottom, if it seems to be browning too much, then transfer the bread directly to the oven rack for the remaining baking time. It’s sometimes tough to know if the bread is baked perfectly, but the outside should be golden brown. Remove from the oven and let sit for 10 minutes before slicing in. If the inside is a little undercooked, no worries, just note that for next time. Sometimes there is trial and error involved when baking a new bread. Slice and serve! Wrap up any remaining bread (as if!) with plastic wrap to keep fresh. i’ve been wanting to try this for a while! I’m a convert of Saf’s instant yeast (the kind that comes in a vacuum packed brick). Eliminates the proofing step entirely. After hemming and hawing I also bought a breadbox recently. Life changing. Is there a good way to go about this recipe if you lack a stand mixer and dough hook? @ Hapax – I don’t have one and whenever a recipe calls for less than 10 minutes of kneading, I just do it by hand while watching TV. It passes the time, gives you a nice light arm workout and really isn’t as horrible as it might seem (I make pizza dough once a week and it calls for 8 minutes of kneading, I’ve never found it excessive). I agree! I’d be kneading by hand if I didn’t have this injury. That looks absolutely gorgeous—and I agree that there’s no reason to be intimidated by bread-making. One thing I miss, being gluten-free, is kneading bread dough! If a recipe calls for 10 minutes of kneading, I find 100 “kneads” works just about perfectly. This looks a ton like a baguette, but a lot less complicated. I have been using the Julia Childs recipe for that and it calls for 1,000 whacks and turns in the kneading process, which is fun but time consuming. It also calls for yeast from a brick, but I just ignore that. Any chance on getting a recipe for rye bread? All of my attempts at that have been a disaster, although people have been loving my wheat bread. My boyfriend’s favorite food is bread. Any that I come across I always have to make! Mark Bittman describes his olive oil bread the same way (biscuity) in his book How to Cook Everything Vegetarian. I made this two or three times this past summer since it’s so quick and easy. Oh funny! I guess it’s the nature of olive oil breads…? Do you think I could make this with whole wheat flour? Echoing an earlier question–any adjustments you’d make with whole-wheat flour? Would around ten minutes of kneading by hand do the trick? I haven’t got a standing mixer. Aaaand, would adding some herbs like rosemary, or mixing in some chopped kalamata olives mess up the recipe, or do you think it’s safe to experiment? I have some fresh yeast that I would like to use for this bread; how much should I use – and at what point should I mix it in? I love it that the second time it only needs to rest 15 minutes – will this short rising time change if I use fresh yeast? How well would a dough like this lend itself to being made and left to sit overnight? It’s quite simple enough looking and I thought it might lend itself well to be made into rolls for Christmas. I think it would make great rolls. I’ve had it sit overnight accidentally and it was just fine. I loooooove olive oil bread. I’ll give you a tip. 🙂 Olive oil bread is the best bread to use when preparing gazpacho. Looks superb! I am in love with olive oil bread. Tapas shares the same belief I see!! This bread turned out marvelously! Thank you so much for the recipe Isa! 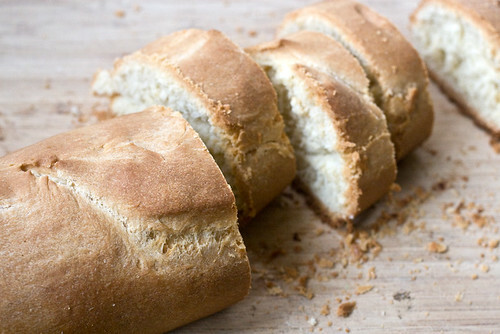 This is the most delicious soup-dipping bread ever, the olive oil makes it so flavorful. It was a great texture, and not difficult at all to make as far as yeast breads go. I definitely recommend making this! Oh, Also, I did knead it by hand (someone asked about that further up on this board). I kneaded it by hand for the 3 minutes then for another 5 or 6, until it was smooth (as the recipe indicated). Worked great! I subscribed to your web page but I never got any new post in my e-mail box 🙁 . Can you put me on your suscribers list. Thank you . I luv your books and website. I made this bread a 2nd time tonight: this time I subbed 1/3 cup potato flour for 1/2 cup of the all purpose flour. I had to add a few extra drops of water while kneading, but it turned out fantastic. Actually, I even forgot to turn the temperature down, but luckily I was watching the bread and took it out a few minutes early instead. DELICIOUS. Thank you Isa! 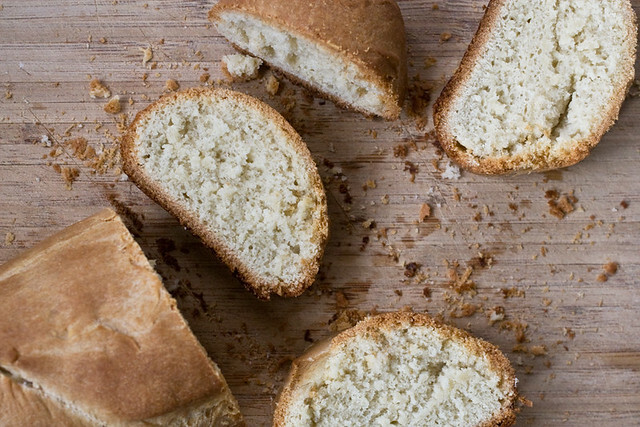 completely adore this bread recipe!! soooo lovely. I made mine with 2 cups whole wheat flour & 1/2 cup all purpose with 3/4 cup of chopped basil and it was beyond delicious. Will most definitely bake again! I have a question about the bread hook on a standing mixer. I’ve never used the hooks on my mixer and I was wondering, when the recipe says to mix the dough and then knead it with the hooks, are you switching back and forth between the mixer paddle and the hooks, or are you kneading and mixing with the bread hooks? I usually just used the bread machine out of laziness, but homemade bread is just better. I just use the hook attachment, not the paddle at all. Everyone once in awhile I get in there with my hands to switch it up, but no paddlin’. Made this tonight. Totally hit the spot. Reminds me of the fresh bread my Italian grandma used to have fresh at every meal. This bread was frickin delightful. I am not a bread baker, and I had my doubts while sending my misshapen loaf into the oven – however, it came out great! Biscuity and delicious. Will enter the regular rotation for sure! I made this to go with Christmas dinner at my in-laws, and everybody loved it. I kneaded it by hand, since my in-laws don’t have a standing mixer…no biggie. One thing that surprised me is that it made a pretty small ball of dough, so I ended up making a second ball. Very good bread. Everybody was impressed (because they usually eat Iron Kids bread and sweet potatoes from a can)! Hi there. I just bought a bread maker. Can this recipe be used in a bread maker? Thanks for anyone who can help ! I’m sure you could. I don’t have a bread maker though so I can’t say. I just made this and it turned out great! I was trying to save it for soup later on but may eat most of it plain! I kneaded by hand and thought the dough was very manageable. I LOVE making bread. 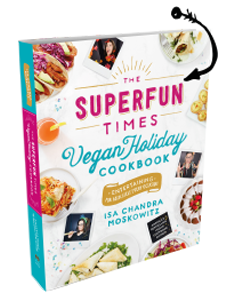 This makes me hopeful/optimistic that Vegan Loaves will soon be joining Vegan Cupcakes/Cookies/Pie on my shelf. Pleasseeee? I made this tonight. I added rosemary and it was most excellent! Hey Isa! We tried this recipe and oh my gosh it’s delish! And I used whole wheat flour accidentally, but it tastes ok. Well, I was wondering if I could maybe use this recipe and put in the other ingredients for gingerbread, to actually make ginger bread? Couldn’t this be shaped into dinner rolls? I just put the dough out to rise. I’ve made this bread a few times before and it really is very good and easy to make. I don’t use a mixer and the dough comes together for me with 2.25 cups of flour. i place the bread to rise in an oven that’s been on 400F for a few minutes to create a hot spot. I find I like these breads that have a short second rise. Does anyone know what kind of breads the short rise benefits or can I do this with any bread? pull apart rolls are my favorite and they have the stickiest dough + two short rises. Would it be okay to just knead this all by hand since I don’t have a bread hook or stand mixer? Love this bread! I bake with whole spelt flour and my own hands and it is so good! Super easy to make and I already made a couple of times! Thanks Isa! What kind of Flour, Wheat or White???????????????? It’s gorgeous! I’ve made it twice. Hopefully people with 8 million questions read this. I made this tonight as recipe # 126/145 as I cook my way through Isa Does It. I do not have a stand mixer. I warmed the bowl I used and mixed the beginning ingredients with a fork until I could no longer use it and needed to use my hands. I kneaded nearly all of the flour into the dough and then continued to knead more. After rising I rolled mine out and then overworked it ’cause it just wasn’t right and redid the whole thing until it was a disaster and looked nothing like the photo. But you know what?? It turned out great! I know, I was shocked. Try the recipe, make it work. Can I use bread flour instead of all purpose four? I too tweaked an old cookbook recipe to include olive oil and I bake it that way always now: Heat one cup of whole milk, tablespoon of sugar, teaspoon of salt, six tablespoons of olive oil, just to boil while stirring and set aside to cool. While the above is cooling, combine one cup of lukewarm water, one teaspoon of honey and one packet yeast, allow to flash (foam). Next you’ll need six cups of ordinary unbleached flour. When first mixture is cool enough to not burn your finger, add 1-1/2 cups of the flour & beat it until smooth. (This is the part where that KitchenAid mixer pays for itself.) Now add in the yeast mixture and continue beating. Add another cup of flour and continue beating. Switch to the dough hook and add another cup. Continue adding flour until dough clings to the dough hook. Let the dough hook keep kneading for you for 10 minutes. Turn out onto a floured surface and kneed in the rest of flour by hand. Heavily grease a deep bowl with additional olive oil, form the dough into a ball and roll it until the ball is lightly covered with oil. Cover and let rise until at least doubled in size. Divide into loaves for 3 standard size loaf pans, greased and lightly floured for easy removal. Bake at 350 for about 30-40 minutes, (depending on location and stove) or until a nice medium-dark brown.